Cutting through the north part of England, stretching from Newark to Huddersfield, is the road called A616, and one area in Stocksbridge, near Sheffield, holds a section of the highway called the Stocksbridge Bypass. This portion of the road opened in May 1988, in order to connect the M1 motorway with the Woodhead Pass and the A616, passing through quaint hills and moorland on the way. It is most well-known for being one of the deadliest roads in the country, as well as one of the most haunted places in the world. The bypass purportedly has had high strangeness revolving around it ever since construction began in 1987. Construction workers at the time frequently reported hearing strange sounds as they worked, including anomalous bangs, voices, or the laughter of children, which seemed to skirt about the periphery of the site. Most dramatically were the sightings made of ghostly apparitions around the construction site, with one of the first and perhaps most notable case being that of two site security guards by the names of Steven Brookes and David Goldthorpe, who were on patrol at around midnight one night of September of 1987 when they saw a group of mysterious children playing in the construction site in a muddy field near an electricity pylon at a place called Pearoyd Lane. This was obviously not a place for children to be playing, especially at that hour, so the guards approached to see what was going on. As they did it became apparent that the children were wearing very old-fashioned clothing, which seemed very odd to the guards but was not enough to cause any concern at this point. The children seemed to be dancing about holding hands in a circle, and did not seem to notice the approaching men, however, as they drew closer the kids allegedly just blinked out of existence, simply there one second and gone the next. An inspection of the area showed no sign of any footprints or disturbance in the mud, which should have certainly been there considering all the dancing and playing the kids had been doing. This was startling and odd enough that the next day they asked around to some of the construction workers who slept in caravans nearby, and they too confirmed that they had also heard the laughter of children the night before. The two guards were definitely spooked, but returned to their duties that evening. Once again, as they passed the very same area they experienced something very unusual, although this time it was a bit more sinister than a bunch of phantom kids. On this occasion they were driving past when there suddenly appeared in their headlights the tall, dark figure of what looked like someone in robes reminiscent of a medieval monk. They slammed on their brakes, and noticed that the headlights seemed to pass right through the stranger. It stood there glaring at them for a moment before suddenly vanishing right before their eyes. The odd incident was terrifying enough for them that they called their supervisor in a state of panic, although no sign of the figure they described would be found. The supervisor was skeptical of this talk of ghosts, instead suspecting that is was some trespassers messing around, and called in two police officers by the names of PC Ellis and Special Constable John Beet. The two men then went about conducting a stakeout to try and catch the intruder in the act. As they sat there spacing out in the dark, not really expecting to see anything at all, something then pressed up against the side of the car they were in, appearing the torso of a person wearing “some kind of cravat and a waistcoat.” As the startled policemen looked on, the figure then instantaneously appeared on the other side of the car and just stood there peering in at them. As they got out to confront the stranger the figure just vanished, leaving them completely dumbfounded. As they stood there wondering where the man had gone, they claimed that their car had then been banged and jolted by an unseen force, enough to send it rocking. At that point they said that they had been overcome with a palpable dread and quickly drove out of there. I could normally complete the run in about thirty minutes but on this occasion my son asked if he could come with me…We reached the church in about three quarters of an hour but Nigel kept getting the stitch so on the way back I ran on to make time until he caught me up. I was not tired because I was not running at my normal speed and it was dusk at the time but not dark. As we approached a lay-by coming towards Wortley village I suddenly saw a chap walking with his back towards the oncoming traffic. I looked at this figure and my brain just could not take in what I was seeing. He was dressed in what I would say was eighteenth century costume and wore a dark brown hood with a cape covering his body. He was walking in the ground, not on the level of the road itself and I just could not make out what I was seeing. Then I looked at him directly and saw his face. He was carrying a bag and it was slithering along the surface of the road. It was a dark coloured bag with a chain on it and Nigel said he could hear the chain rattling on the ground. I just gasped and said “who is this silly person?” and realized my son was seeing him too, and at that moment the hairs on the back of both of our heads just stood on end and we could smell something really musty just like we were standing in an antique shop. I saw him clearly and was looking directly at him, probably no more than fifty yards away from me with his face towards me and his back to the traffic. He was so close I could see that every half-inch down the cape there was a button, it was that clear. It was a long cape, dark brown in colour and very worn, with a “lived in” look about it; it was so real you could have walked up and touched it. He walked straight past us as we stood there amazed in the middle of the road. Then a lorry came with its lights on and he just disappeared. I will never forget that musty smell, the cape he wore and the blank face. I looked right into the face and everything was black, just like a miner’s face but without any eyes. It was the strangest experience of my whole life. I couldn’t actually see an outline or any facial expression and there were no clothes as such, it was just a grey outline of a person. I could see a head and shoulders, with arms and legs flying everywhere. It was just running aimlessly across the field and I thought it was a jogger until I realized that it wasn’t actually touching the ground. It was around three feet above it. There is an embankment that comes up to the road and it leapt from the field over the embankment and landed in the middle of the road in front of us. It seemed to hit the car and just vanished. I just screeched to a stop and it just seemed to melt into the car and all of a sudden it was gone. I looked at David and said “What’s happened? It’s just gone,” and we got out and looked around but we could not find any trace of anything. We were both left really shocked and upset and I could not believe what had happened. All I could think was that it must have been a ghost, whatever a ghost is. From a distance it looked like someone trying to cross the road but as I got nearer I could see it was like a man in a long cloak. Then I realized it had no face and it was just hovering above the road. I just slammed the brakes on and swerved to avoid hitting it, and it was only through Jane grabbing the wheel that we managed to stop the car from crashing. In some cases, phantoms have even appeared inside of vehicles, such as is a 2002 case in which a woman claimed that she had smelled a horrific odor pervade the car like a “rotting body,” after which she looked around to see a robed figure sitting right there in the backseat of her vehicle. The wraith then glared at her with glowing eyes before vanishing into thin air. There are also reported loud bangs of thuds on cars passing through, often described as sounding almost as if someone has landed on the roof, cars being shaken when there is no wind out, and various vehicular malfunctions, all of which add to the speculation on the real reason behind the road’s deadly reputation. In recent years the news of these hauntings and the ominous rumors orbiting the Stocksbridge bypass have attracted media attention and garnered appearances on supernatural TV and radio programs, and the area has become a magnet for paranormal researchers, some of whom have had strange experiences of their own here. In 2017, paranormal investigator Phil Sinclair decided to make trip out to the bypass to do a little ghost hunting and got more than perhaps he even bargained for. I saw a f***ing man there. Who was that? There was a man, there was something there. Is there something evil here? I’m a little bit shook up to be honest. Definitely saw a man but can’t explain it. What is that growl? There’s something not very nice around here asking me for my soul. Something is mocking me around here. I literally struggle to find the words to describe what I witnessed during this investigation. I will be left with an image I will never forget. I feel I was making contact with multiple spirits either children or that of a male. I can’t help to think I was dealing with an evil presence which ultimately told me to get out. What secrets and mysterious forces does this stretch of road hold? 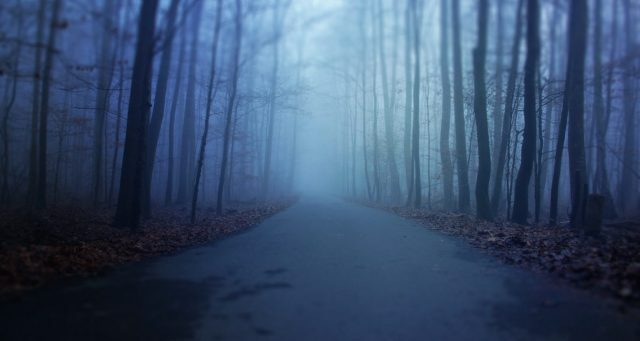 Are there really spirits here or is this all urban legend and spooky campfire tales? It is interesting to note that many of the paranormal experiences reported from the Stocksbridge Bypass have been witnessed by more than one person, making it harder to write-it off as delusion or the hallucinations of a tired mind out on the road at night. Could there be anything to any of this, and if so, why should these lost souls be tethered to this place? Whatever the answers to these questions may be, the Stocksbridge Bypass remains one of the eeriest and most haunted roads in all of England.